Guare and Dawson (Smart But Scattered), Russell Barkley (considered America’s foremost expert on ADHD), and numerous others have made coaching the number one recommendation for supporting students with Executive Function challenges. For some students, the first course of action may be medication, but that alone does not guarantee success. Students need to be taught strategies and to then practice those strategies until they become habits. Our approach works. We apply research-based methodology in our coaching. Our students' school performance improves and top clinicians and educators readily speak to our success. School professionals, neuropsychologists, psychiatrists, and networking groups consistently recommend us. Most significantly, our parents express consistent satisfaction with the improvements they see. To further evidence our results, Beyond BookSmart is currently conducting an ongoing nationwide research study on the efficacy of Executive Function interventions through individualized coaching. 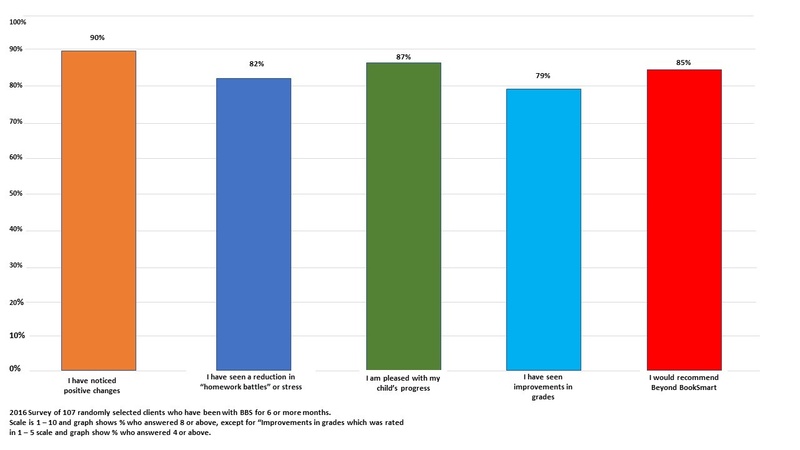 This research study uses the BRIEF-2 (Brief Rating Inventory of Executive Function which is often used in neuropsychological assessments) as a tool for assessing improvement over time in Executive Function skills for students ages 11-18 receiving our coaching. Beyond BookSmart's philosophy, coaching skills, and strategic tools are like nothing we have ever seen in the last 35 years that our practice has been in business. Pediatrics West P.C. and New England Center for Academic Success are proud to affiliate with Beyond BookSmart and their talented team to round out services for our pediatric population.